Her dog was diagnosed with a heart disease after being fed a grain-free diet. Is there a link? 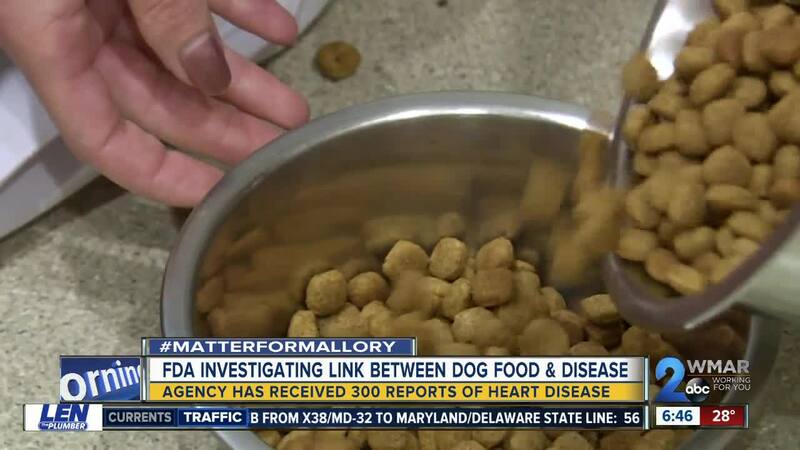 The FDA is investigating a link between canine heart disease and boutique, exotic, and grain-free diets. The agency received nearly 300 reports of heart disease since July. BALTIMORE — Alison Sheaffer noticed her double doodle , Nyla, had some thinning on her nose and decided to take her to the veterinarian for a check-up. Nyla was prescribed thyroid medication, but after having an adverse reaction to one pill, Sheaffer brought her back to the vet. "So I took her back, and he did an X-ray of her to make sure she didn't have any obstructions, and then they found the enlarged heart," said Sheaffer, a Fallston, Maryland, resident. Nyla was diagnosed with advanced dilated cardiomyopathy (DCM), a heart muscle disease that can lead to heart failure. "She still has a pretty significantly enlarged heart, her muscle function's abnormal, her heart rate's controlled which is a really good sign," said Steven Rosenthal, a board-certified veterinary cardiologist with CVCA Cardiac Care for Pets . While large breeds are more prone to the disease, Nyla's age, just 5 years old, made Rosenthal question her diet. Sheaffer switched Nyla's diet last June to a grain-free dog food after she was having stomach sensitivities. "It's very possible that it had a role. Nyla is part golden retriever and we see an increased incidence of the grain-free diet associated dilated cardiomyopathy in the golden retriever, but we've seen it in all breeds of dogs, small and large alike," Rosenthal said. An uptick in cases, particularly in atypical breeds, led CVCA Cardiac Care for Pets to contact the FDA. The FDA announced it was looking into the potential connection between certain diets and DCM in July 2018. So far, they've received 300 reports of DCM. And of the nearly 200 DCM reports to the FDA in which dogs only ate one kind of diet, 90 percent of those foods were labeled grain-free. In February, the agency provided an update on the investigation, saying they've received additional DCM reports, but they have not identified specific recommendations about diet changes for dogs who are not displaying DCM symptoms. Instead, they are encouraging pet owners to consult directly with their veterinarians for their animal’s dietary advice. Other studies have also investigated the link between BEG, an acronym for boutique, exotic and grain-free diets, and DCM. In one study , researchers found that of the 24 golden retrievers who were eating BEG diets at the time DCM was diagnosed, all but one of the dogs showed substantial echocardiogaphic improvement after a diet change and the addition of supplemental taurine to their diet. Still, there are questions as to what exactly these diets include or leave out that could lead to illness. "There have been many theories including these diets may have a deficiency in an amino acid called taurine," Rosenthal said. "Also, most of these diets are very high in legume content: lentils, peas, chickpeas and beans. And there's some concern that maybe those legumes might be playing a role in altering the absorption of certain nutrients in the diet or one of the theories is if there's some type of toxin in the legumes that we're unaware of. Again, we're trying to figure that out with the FDA. At this point in time, we don't know that answer." The good news is Rosenthal is starting to see less of these cases from a few a month to one every several months. He thinks it may be due to more awareness. The bad news is when a dog is diagnosed it's usually in the late stages of the disease. Nyla's diagnosis has not only been emotionally taxing but also costly. In two weeks, Sheaffer said she spent $3,000 on different tests and pills, which is why she wants other pet owners to investigate the ingredients, nutritional content and testing standards of the dog food company they choose. "You know, this is my dog and I love my dog like I love my kids," Sheaffer said. "So, I'm going to go with she's going to be OK and hope for the best." When Nyla was initially diagnosed, Sheaffer was told she may only have a year. However, with the change in diet and medications (five pills a day plus supplements), the Sheaffer family is hopeful Nyla's health will improve. Sheaffer recommends anyone with questions about taurine-deficient diets, visit TaurineDCM.org . Rosenthal also recommends feeding your pet a food that's formulated to meet Association of American Feed Control Officials standards. "At this point, we recommend using a diet that goes through aggressive feed testing, so there's certain companies that take their diets and then feed it to dogs in colonies at these nutrition sites that they make sure the diets are nutritionally adequate," Rosenthal said. The World Small Animal Veterinary Association has created a list of questions for pet owners to ask food manufacturers. See their recommendations on selecting pet foods here . The Pet Food Institute has also provided a list of frequently asked questions and answers relating to the FDA's investigation. You can read more, here .